Sports Rendezvous: Fiji defeats Kenya to claim Canada Sevens. Fiji defeats Kenya to claim Canada Sevens. Team Fiji celebrates after winning the 2018 Canada Sevens Rugby Tournament. 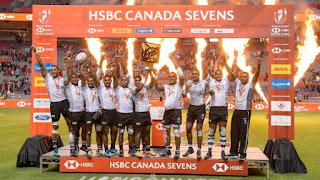 Olympic champions Fiji have claimed the Canada Sevens after prevailing over Kenya in a tense final to close in on South Africa at the top of the overall standings. The two nations were locked up at 12-12 at the break before the experienced Fijians pulled away in the second half, scoring three unanswered tries to win 31-12 in Vancouver - their second triumph from the past three events. The runner-up position was Kenya's best finish in this year's Sevens competition and the first time they had won a medal. Full story at Kwese ESPN.